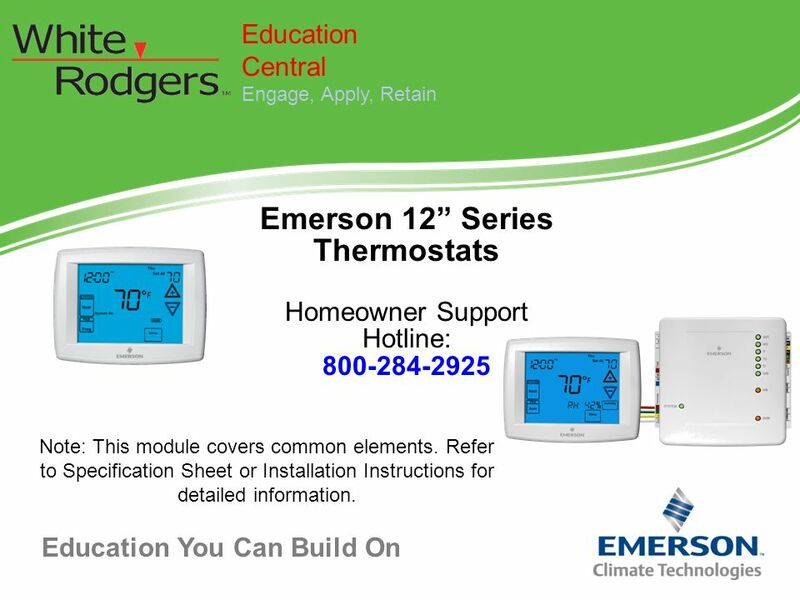 Education Central Engage, Apply, Retain Emerson 12” Series Thermostats Homeowner Support Hotline: Note: This module covers common elements. 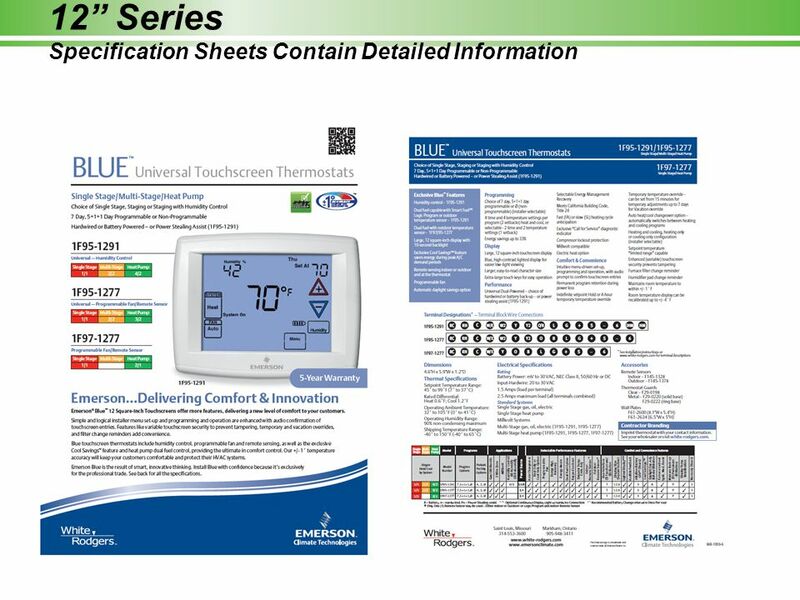 Refer to Specification Sheet or Installation Instructions for detailed information. Power Stealing Assist extends battery life significantly by drawing “stealing” small amounts of voltage from the heat (W) or cool (Y) circuit. Power Stealing Switches on the back of the thermostat should be left in the “ON" position for most systems. 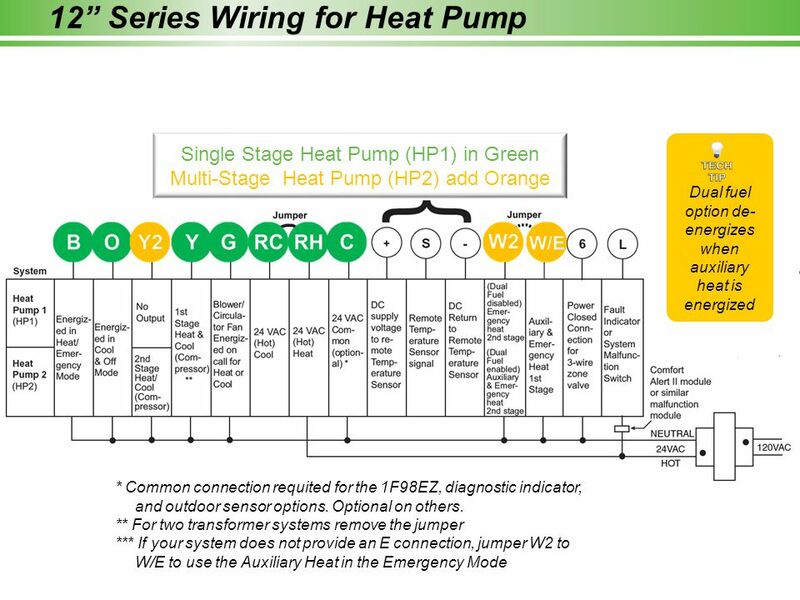 On a small number of heating or cooling systems with high impedance electronic modules you may observe one of the following conditions: The furnace , draft inducer or fan run or continue running when the thermostat is not calling for operation. Switch the “W” dip switch to OFF. If the condition continues to occur switch the “Y” dip switch to OFF to disable Power Stealing Assist completely and operate the thermostat on batteries only. 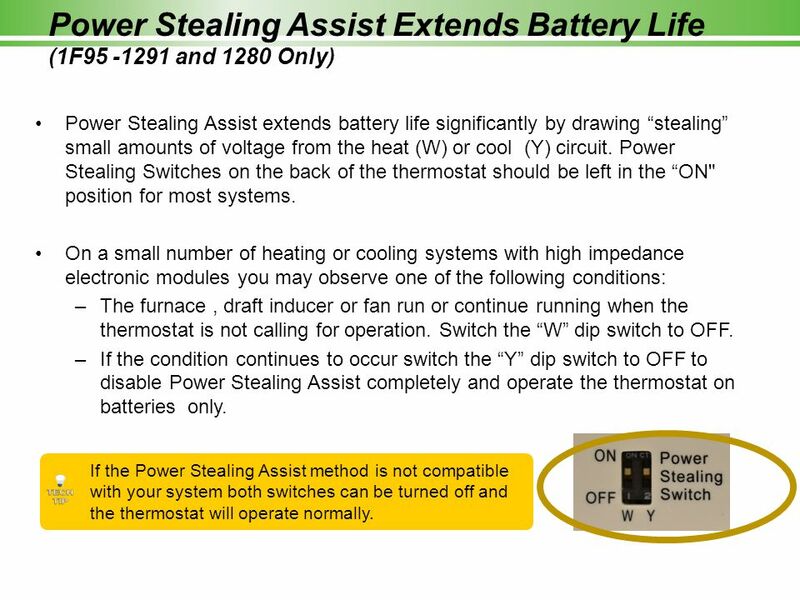 If the Power Stealing Assist method is not compatible with your system both switches can be turned off and the thermostat will operate normally. 15 12” Application Specific versus Customization—Don’t Go Overboard! 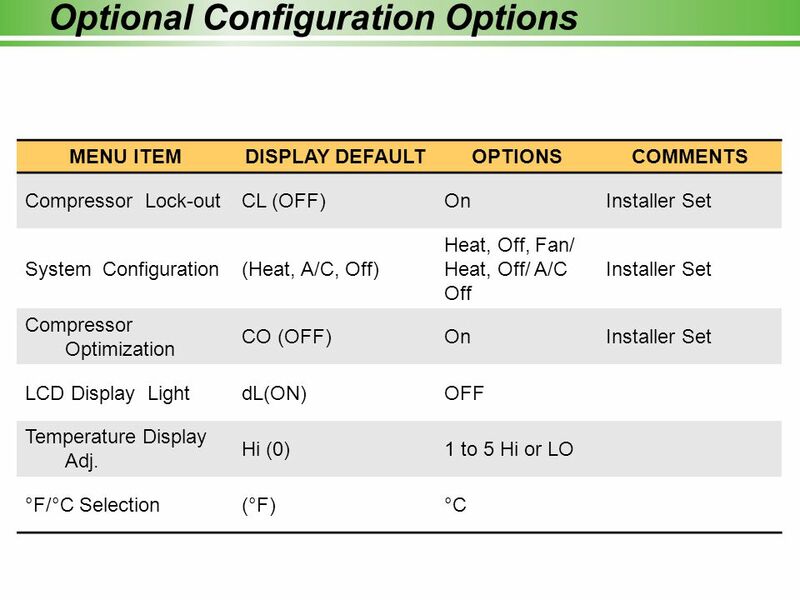 MENU ITEM DISPLAY (DEFAULT) OPTIONS COMMENTS System Configuration (MS 2) SS1, MS2, HP1, HP2 Installer Set Electric Heat Fan (GAS) GAS, ELE 1. Choose System 2. 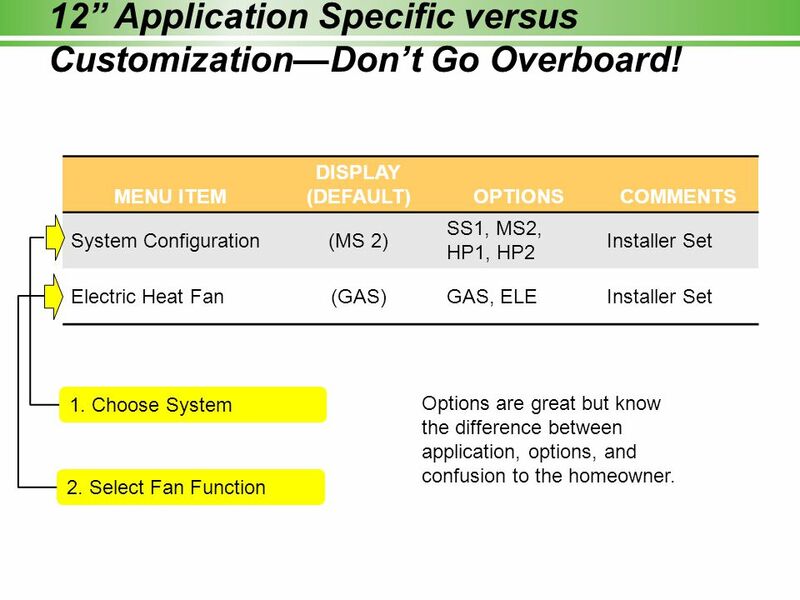 Select Fan Function Items 1 and 2 are what make the thermostat and system work together…Most other menu items except dual fuel are a matter of personal preference… Just keep in mind, the first step is to tell the thermostat what the primary heating source is; fossil fuel or a heat pump? 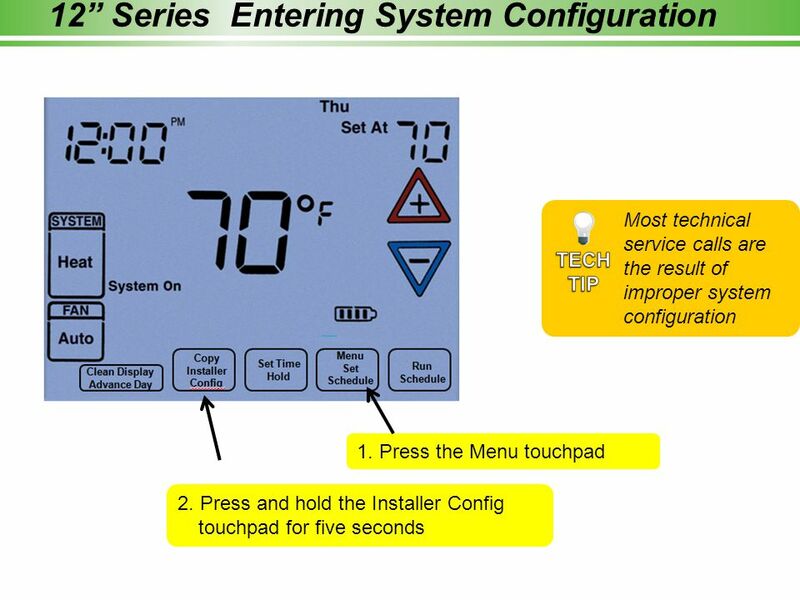 The second step tells the thermostat if the equipment or the thermostat control the fan operation. Fossil fuel systems have a fan control built into the equipment to turn on the fan on a call for heating. Heat Pumps and Electric furnaces require the thermostat to turn the fan on during a call for heating. Once you configure for the system just press “RUN” and you are ready to operate the system. You will see the word “RUN” right above the Fan button at this point. Any of the other configuration options are a matter of choice. Options are great but know the difference between application, options, and confusion to the homeowner. 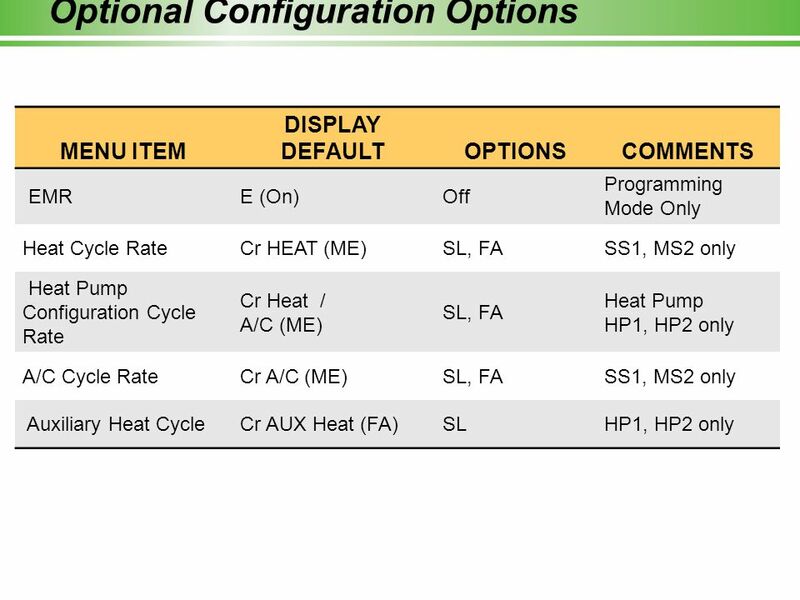 MENU ITEM DISPLAY DEFAULT OPTIONS COMMENTS EMR E (On) Off Programming Mode Only Heat Cycle Rate Cr HEAT (ME) SL, FA SS1, MS2 only Heat Pump Configuration Cycle Rate Cr Heat / A/C (ME) Heat Pump HP1, HP2 only A/C Cycle Rate Cr A/C (ME) Auxiliary Heat Cycle Cr AUX Heat (FA) SL Now that you have configured the thermostats in steps 1 and 2 for the application you can customize the thermostat to meet the needs of the customer. While we won’t go through all the options we will highlight some of the most used options. EMR in step 3 is an acronym for “Energy Management Recovery”. What it looks at is the room temperature during a setback period and also looks forward to the next program time and temp. The thermostat sees the number of degrees it needs to make up and starts early based on that number. Tech Stuff: For non-heat pump systems it allows approximately 5 minutes for each degree it needs to make up. For heat pump systems it allows approximately 15 minutes for each degree it needs to make up. Heat Pumps produce a lower temperature heat than fossil fuels systems so they take longer to recover to set point temperature after a set back period.. The heat pump is started early and locks out the Aux heat until about the last 30 minutes of the recovery period. Neat feature – it allows economical setback and recovery with a heat pump system – conventional wisdom says don’t setback a heat pump because the Aux. will eat up your savings. Guess what? You can setback a pump…and recover….economically. 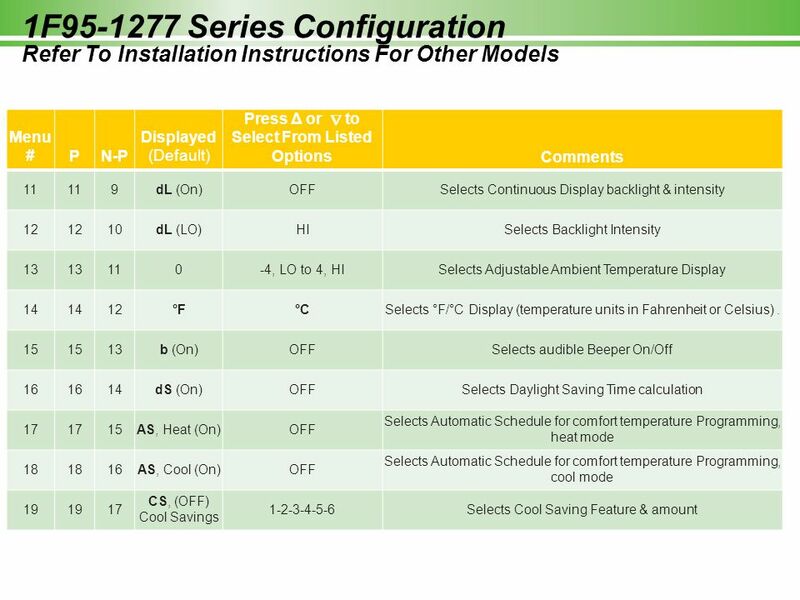 MENU ITEM DISPLAY DEFAULT OPTIONS COMMENTS Compressor Lock-out CL (OFF) On Installer Set System Configuration (Heat, A/C, Off) Heat, Off, Fan/ Heat, Off/ A/C Off Compressor Optimization CO (OFF) LCD Display Light dL(ON) OFF Temperature Display Adj. 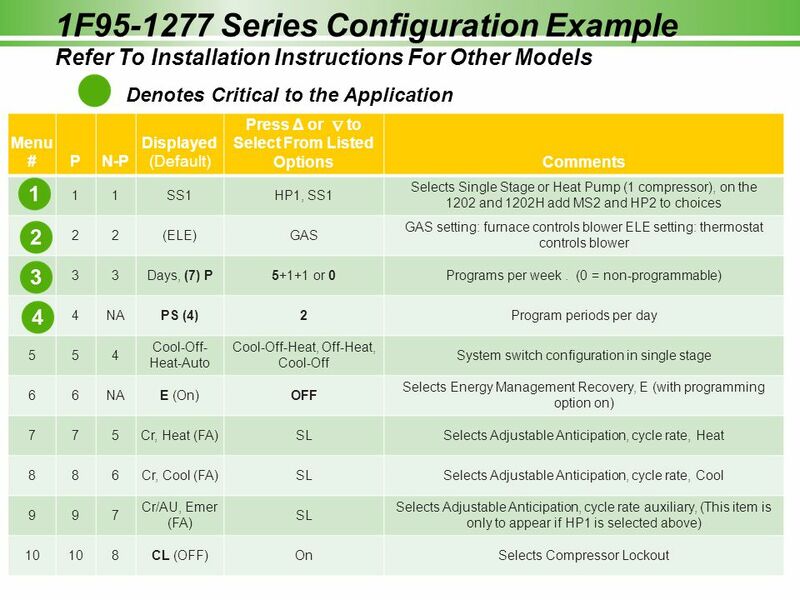 Hi (0) 1 to 5 Hi or LO °F/°C Selection (°F) °C Some other options you may wish to consider are: Step 10, Compressor Optimization. CO gives you a Fan On / Fan off delay in cooling. This assures the air is cold when the blower comes on and also scavenges cooling from the coil after the cycle ends by running the blower for an extra 20 seconds. 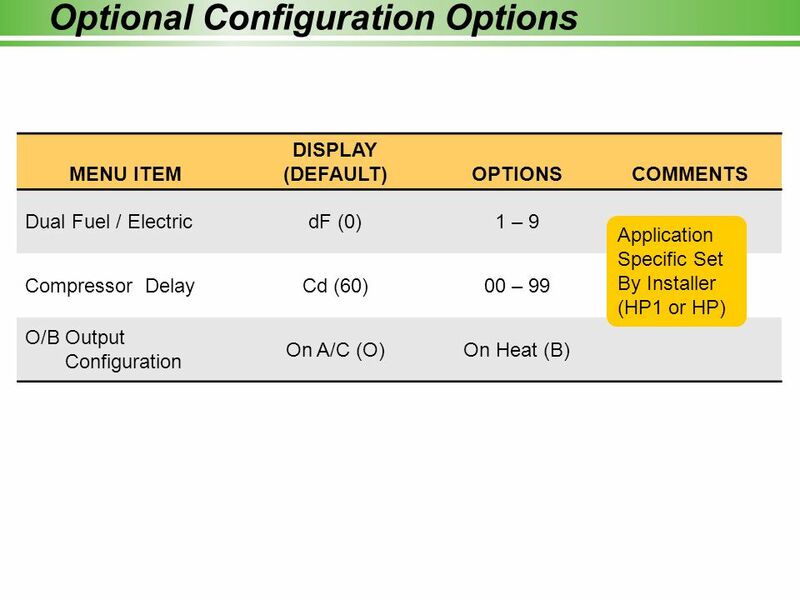 MENU ITEM DISPLAY (DEFAULT) OPTIONS COMMENTS Dual Fuel / Electric dF (0) 1 – 9 Compressor Delay Cd (60) 00 – 99 O/B Output Configuration On A/C (O) On Heat (B) Application Specific Set By Installer (HP1 or HP) Step 21, Dual fuel is for heat pumps with GAS or OIL Aux. Heat. Dual Fuel turns off the pump(s) when Aux comes on so the system does not trip on excessive pressure. Eliminates the need for a plenum mounted fossil fuel kit. 1-9 sets it up for Dual Fuel. Higher number pulls auxiliary in a little sooner. Lower number delays auxiliary slightly. We suggest 5 to start with and adjust as desired. 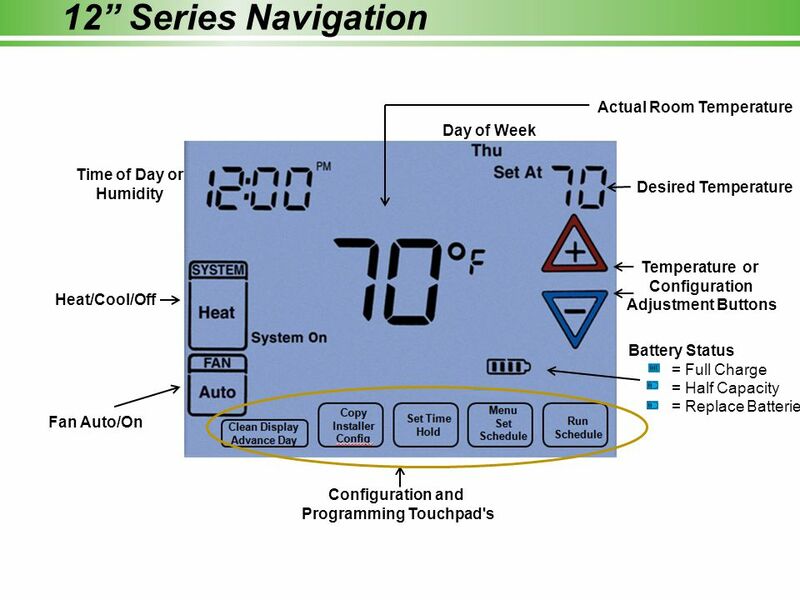 An easy way to remember where to set the values ---up for comfort (tight temp control) and down for energy savings. Remember, if you set the value to zero you disable this option. Step 22, Compressor Delay allows the Aux. Heat and the heat pump to run at the same time…up to 99 seconds. This gives the Aux. a chance to heat up before the pump turns off. This will stop you getting a “slug” of cold air when staging. SS1 MS2 HP1 HP2 Displayed (Default) Press Δ or  to Select From Listed Options Comments 38 l (OFF) Hd On Selects Humidity Display alternate with time. 39 Humidity 00 (Room Humidity) -20 Lo to 20 HI Selects Humidity Display adjustment. 40 (OFF) HR LO, HI Selects Auto Humidity reduction. 41 (OFF) AH H, C, A Selects Automatic Humidification. 42 (OFF) CH Selects Cycle Humidifier. 43 OC (0) od, OFF Selects Optimum Comfort or Optimum Dehumidification or Off. 44 (OFF) Change UV Lamp Selects Change UV Lamp feature. 45 350 Days Change UV Lamp duration days. 46 (OFF) Change Pad Selects Change Humidifier Pad feature. 47 100 Hrs Change Humidifier Pad duration hours. 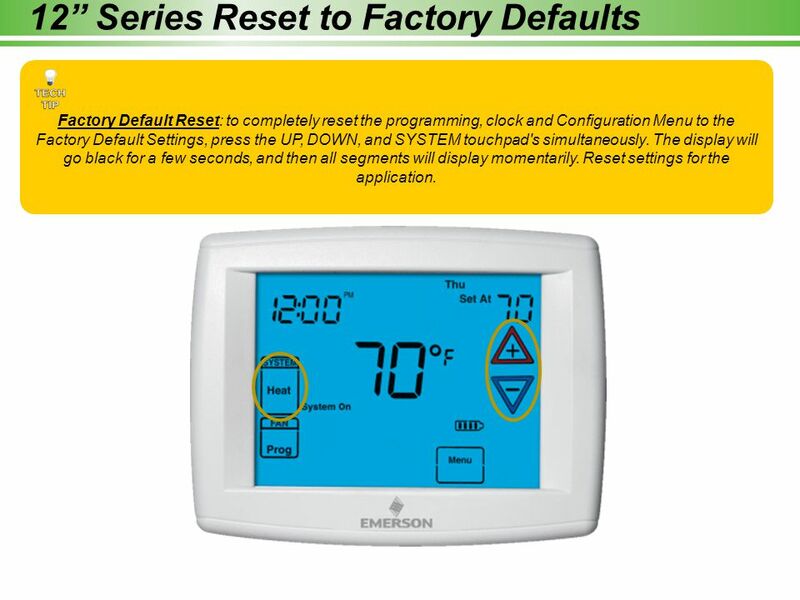 Factory Default Reset: to completely reset the programming, clock and Configuration Menu to the Factory Default Settings, press the UP, DOWN, and SYSTEM touchpad's simultaneously. The display will go black for a few seconds, and then all segments will display momentarily. Reset settings for the application. You may copy any daily program to another day or group of days by pressing the Copy touch pad. In 7 day programming mode when the Copy button is pressed, the other 6 days of the week will flash. To copy the current program into the remaining six days, simply press the Copy button again. To copy the current program to another day of the week, press Advance Day to select the day and press Copy to paste the program. In day programming mode the copy function is similar. 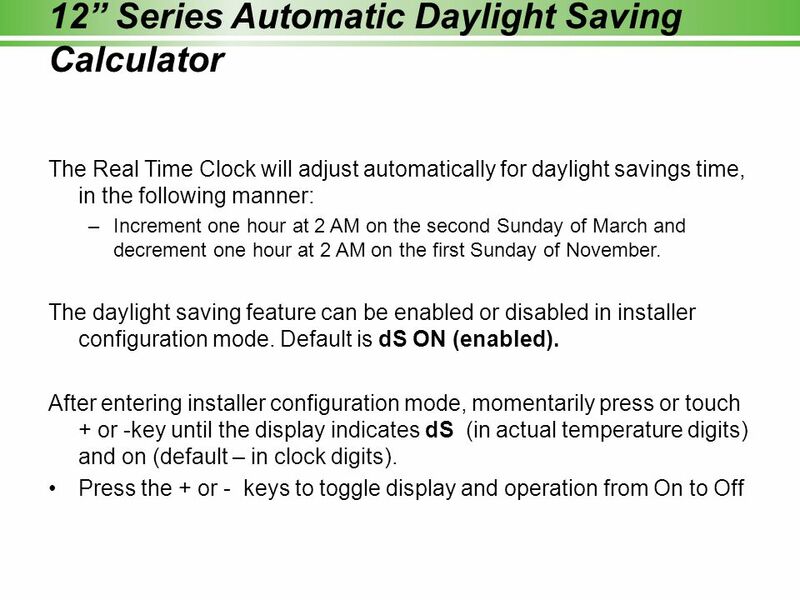 The weekday (Mon-Fri) program can be copied to Sat and Sun (both flashing) or use Advance Day to choose Sat or Sun and press Copy to paste the program. Press the Menu button and then press Set Schedule. 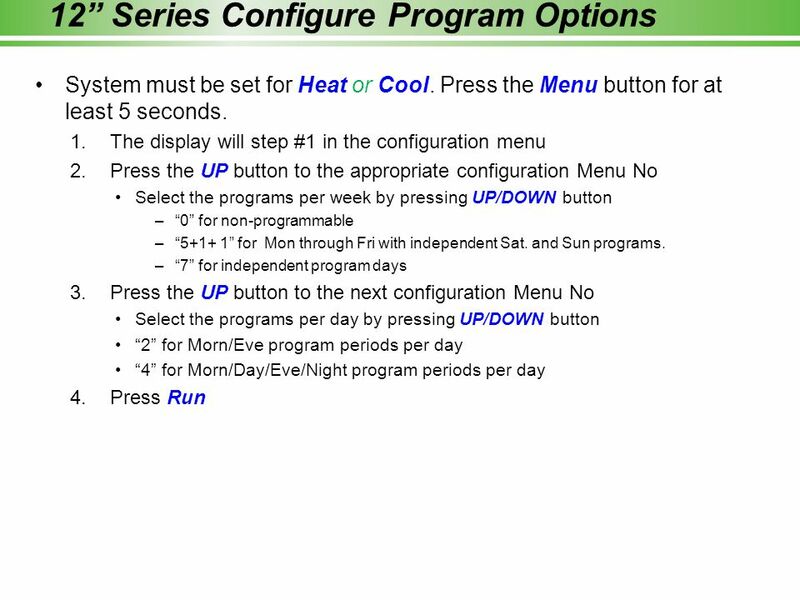 Press SYSTEM button to select either "Heat" or "Cool” in the system switch area indicating the active mode being programmed. The top of the display will show the day(s) being programmed. The time and set at temperature are also displayed. "Morning" will also be displayed to indicate the period. Press PLUS or MINUS touch pad to change the temperature to your selected temperature for the 1st heating period (Morning). Press PLUS or MINUS touchpad to adjust the start time for period. The time will change in 15 minute increments. Press FAN to select Auto or Prog. Press Set Schedule to advance to the next program period. Repeat steps 2 through 6 until all of the program times and temperatures are set for all program periods on that day. Press "Advance Day" to change to the next day and repeat steps 2 through 8. Press Run Schedule To complete programming. 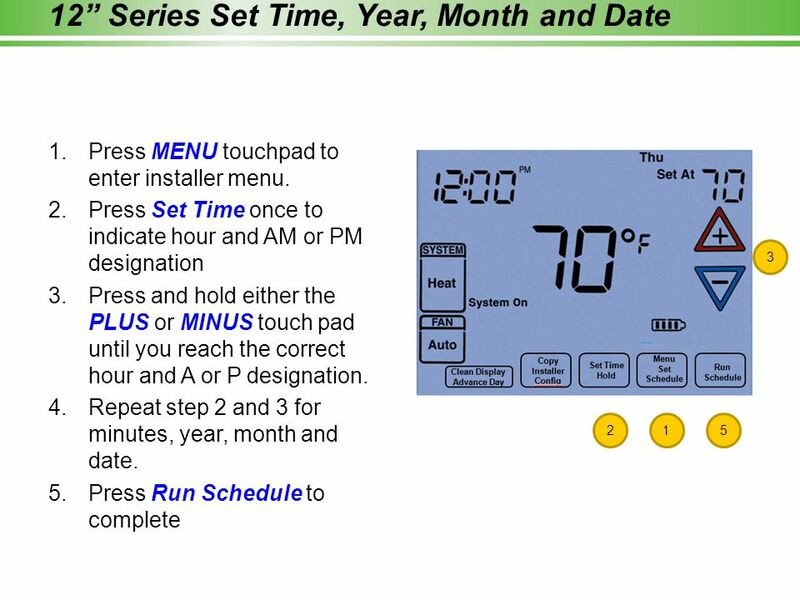 This feature provides a method to program every day with the most popular time and temperature profile using one key press. For this feature to be available, the Auto schedule options (AS Cool or AS Heat) should be set on in the installer configuration. Select the desired “Comfort Temperature” in the setpoint. 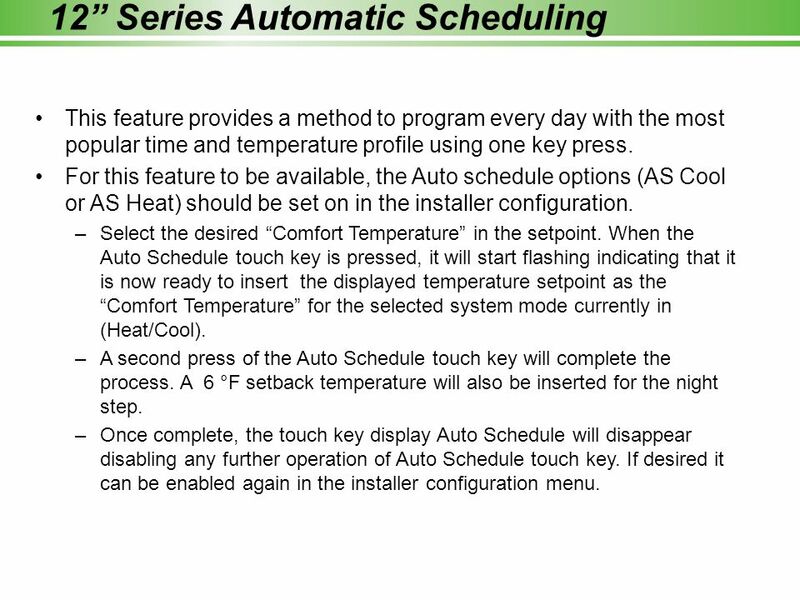 When the Auto Schedule touch key is pressed, it will start flashing indicating that it is now ready to insert the displayed temperature setpoint as the “Comfort Temperature” for the selected system mode currently in (Heat/Cool). A second press of the Auto Schedule touch key will complete the process. A 6 °F setback temperature will also be inserted for the night step. Once complete, the touch key display Auto Schedule will disappear disabling any further operation of Auto Schedule touch key. If desired it can be enabled again in the installer configuration menu. 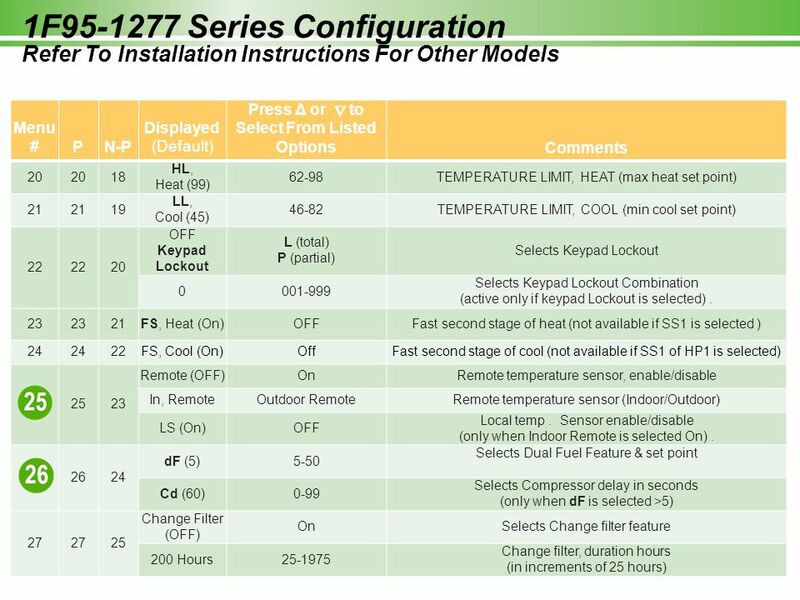 In the Set Schedule mode, the FAN key is used to select the fan operation during a program period. The default state of the Fan key is FAN Auto (fan runs during a call for cool but not on a call for heat). It can be changed to FAN Prog (fan runs during a program period). Each press of the FAN key will change the mode of the fan between Auto and Prog. 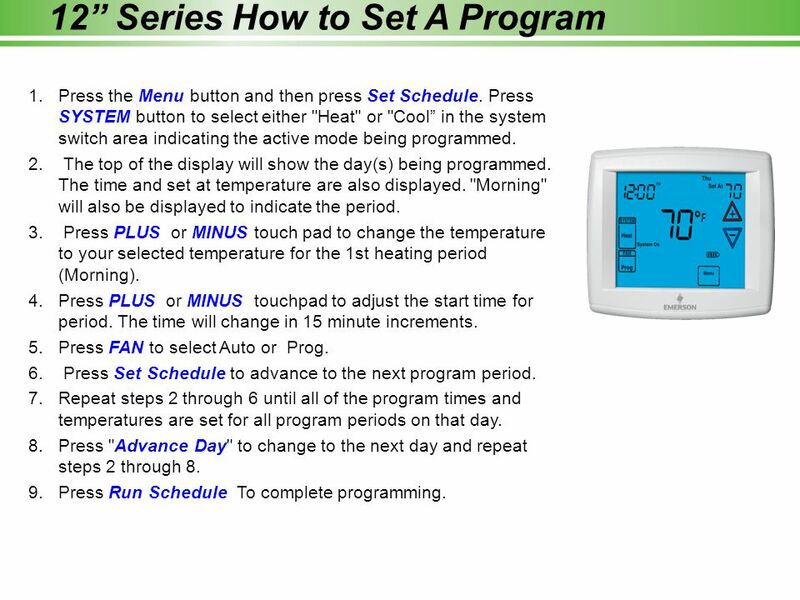 In the Run mode, when a program period that has FAN Prog begins, the fan will turn on and stay on during the complete period. The display will show FAN On Prog. 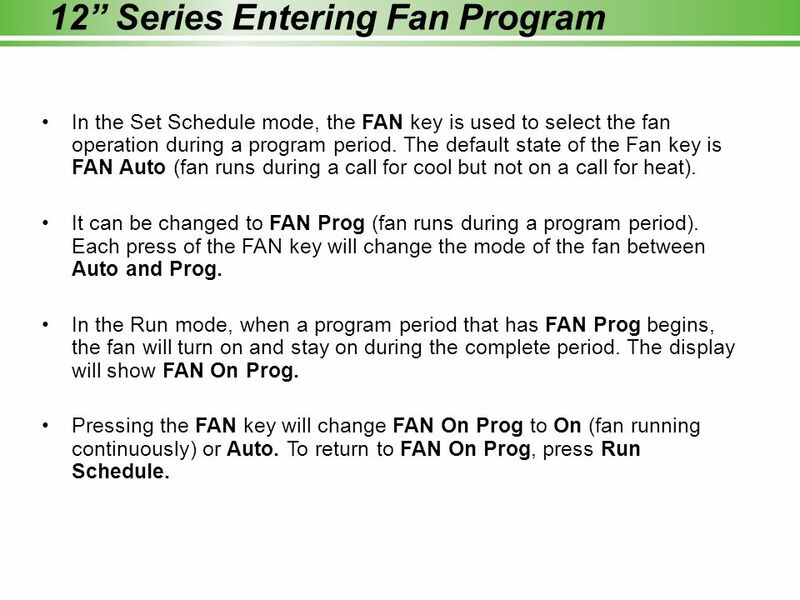 Pressing the FAN key will change FAN On Prog to On (fan running continuously) or Auto. To return to FAN On Prog, press Run Schedule. 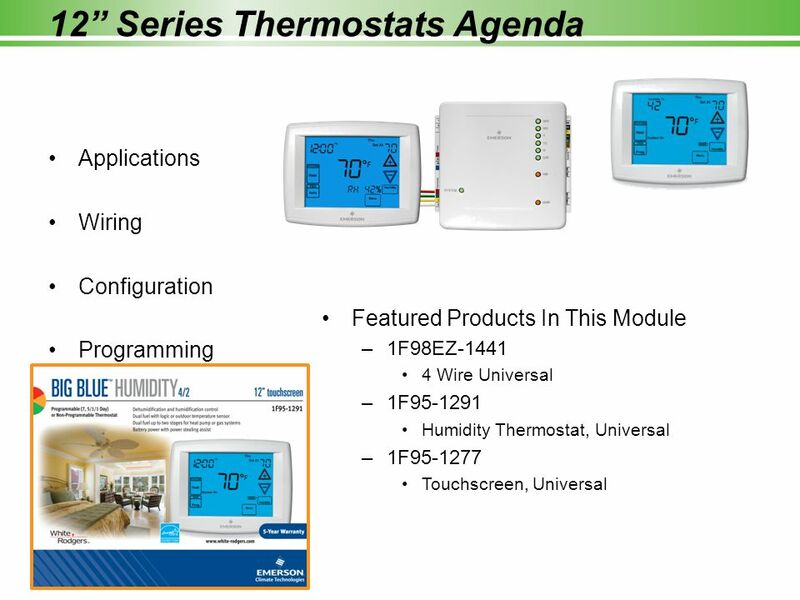 This feature is applicable only in heat pump modes and an outside remote sensor is installed, the thermostat can monitor the outside temperature. 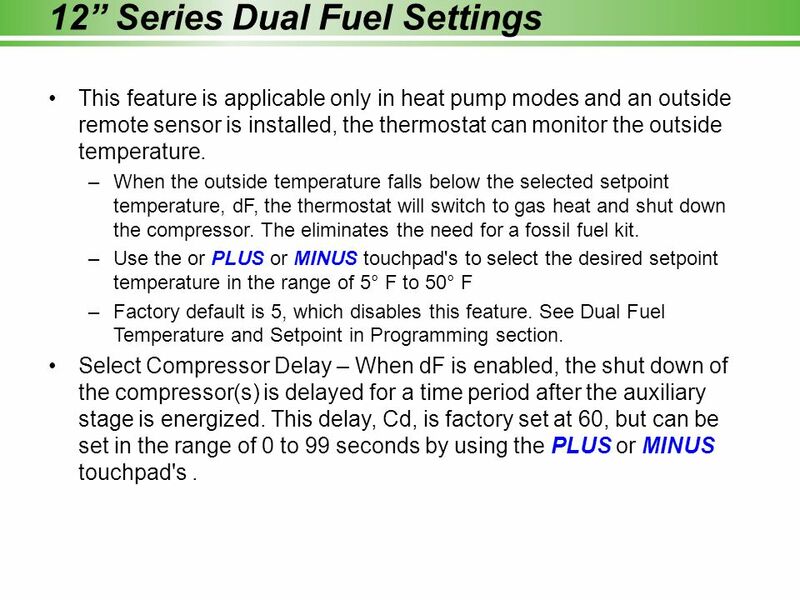 When the outside temperature falls below the selected setpoint temperature, dF, the thermostat will switch to gas heat and shut down the compressor. The eliminates the need for a fossil fuel kit. 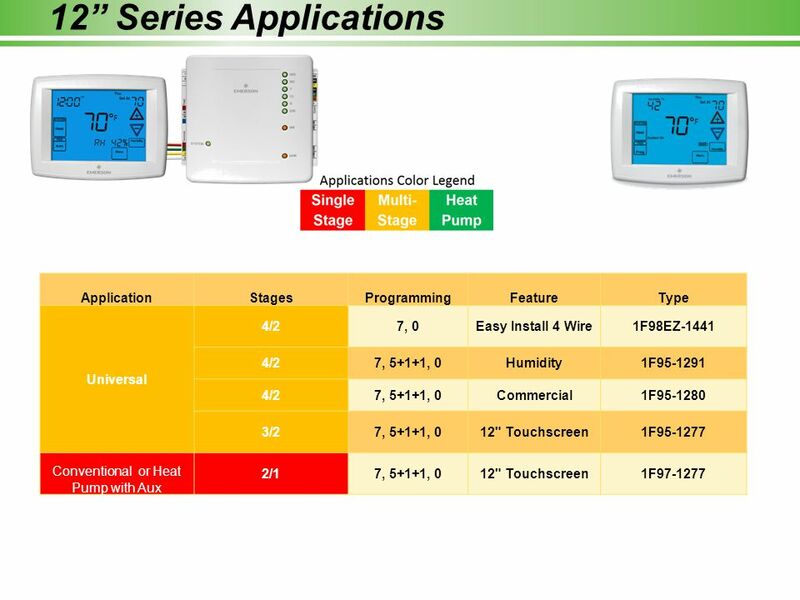 Use the or PLUS or MINUS touchpad's to select the desired setpoint temperature in the range of 5° F to 50° F Factory default is 5, which disables this feature. 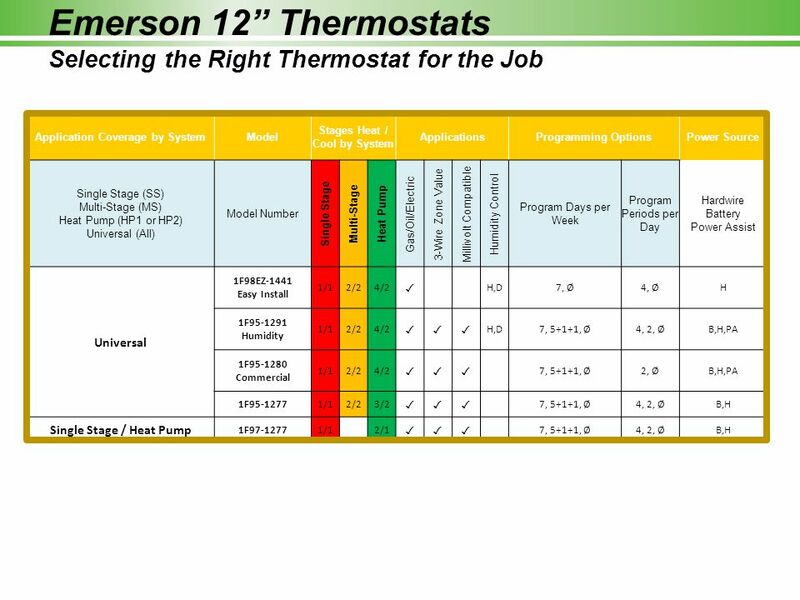 See Dual Fuel Temperature and Setpoint in Programming section. Select Compressor Delay – When dF is enabled, the shut down of the compressor(s) is delayed for a time period after the auxiliary stage is energized. This delay, Cd, is factory set at 60, but can be set in the range of 0 to 99 seconds by using the PLUS or MINUS touchpad's . Heat (Humidification) Press SYSTEM key to select HEAT. 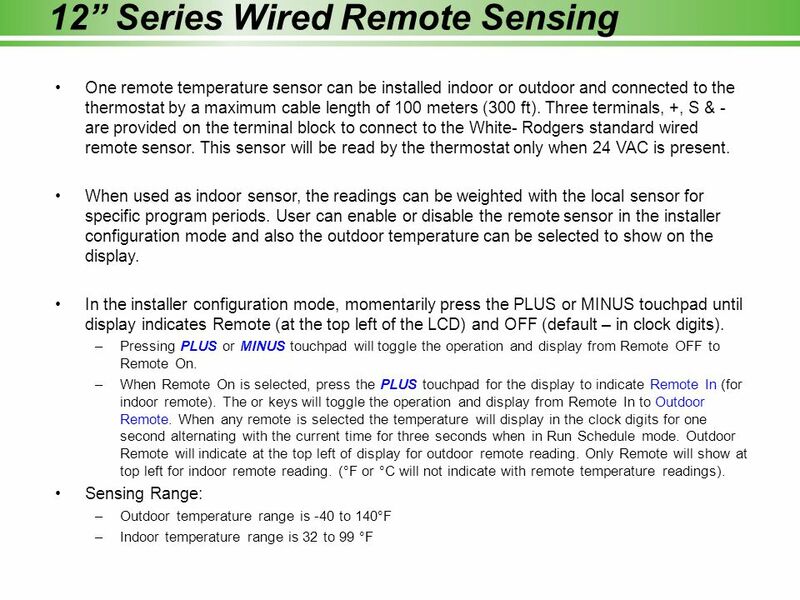 To change the humidity setting when System On appears and the heating system is running press the HUMIDITY* button once. Press UP or DOWN to adjust the humidity level setpoint range. (Humidity setpoint can be adjusted from 5 to 50%.) Hum On will appear indicating it is calling for the humidifier. Cool (Dehumidification) Press SYSTEM to select Cool. 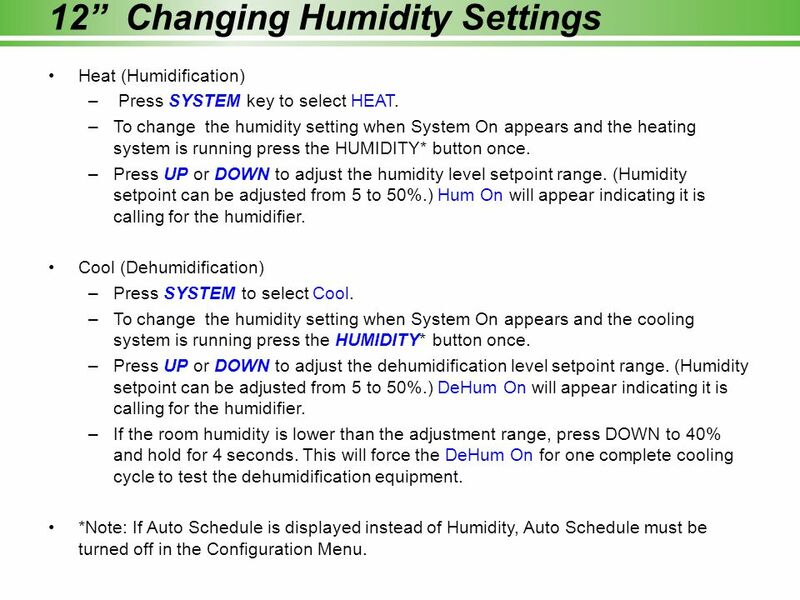 To change the humidity setting when System On appears and the cooling system is running press the HUMIDITY* button once. Press UP or DOWN to adjust the dehumidification level setpoint range. (Humidity setpoint can be adjusted from 5 to 50%.) DeHum On will appear indicating it is calling for the humidifier. If the room humidity is lower than the adjustment range, press DOWN to 40% and hold for 4 seconds. This will force the DeHum On for one complete cooling cycle to test the dehumidification equipment. 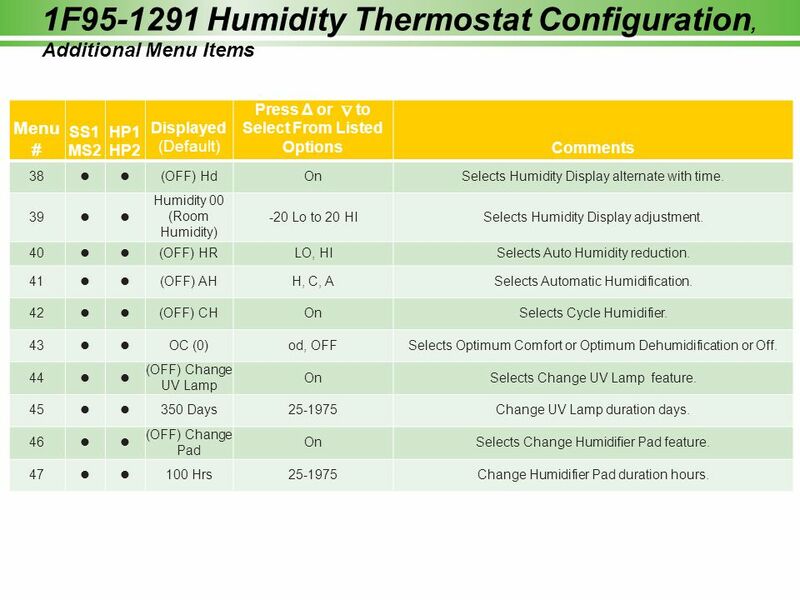 *Note: If Auto Schedule is displayed instead of Humidity, Auto Schedule must be turned off in the Configuration Menu. 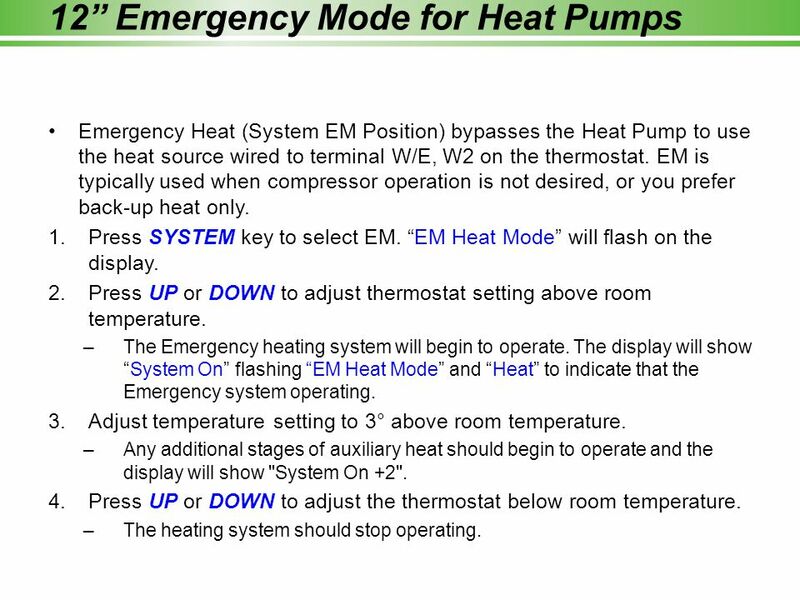 Emergency Heat (System EM Position) bypasses the Heat Pump to use the heat source wired to terminal W/E, W2 on the thermostat. 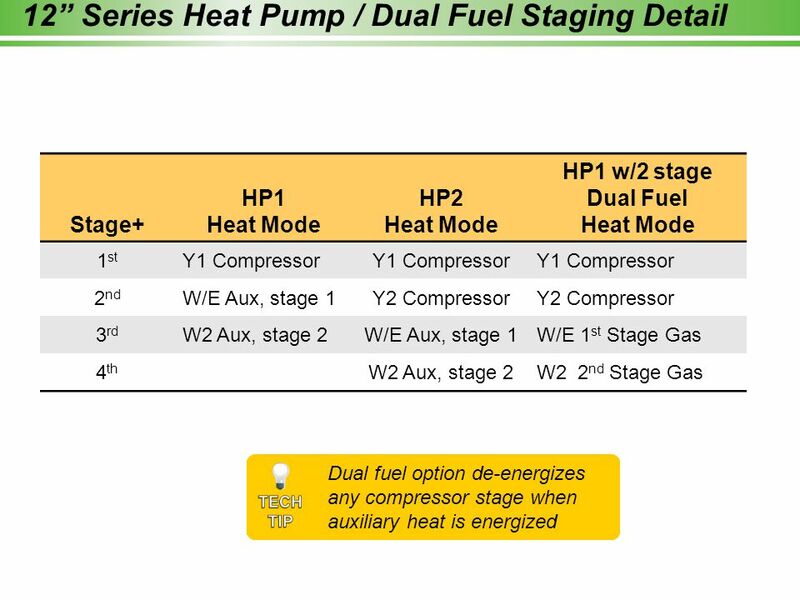 EM is typically used when compressor operation is not desired, or you prefer back-up heat only. Press SYSTEM key to select EM. “EM Heat Mode” will flash on the display. Press UP or DOWN to adjust thermostat setting above room temperature. The Emergency heating system will begin to operate. The display will show “System On” flashing “EM Heat Mode” and “Heat” to indicate that the Emergency system operating. Adjust temperature setting to 3° above room temperature. 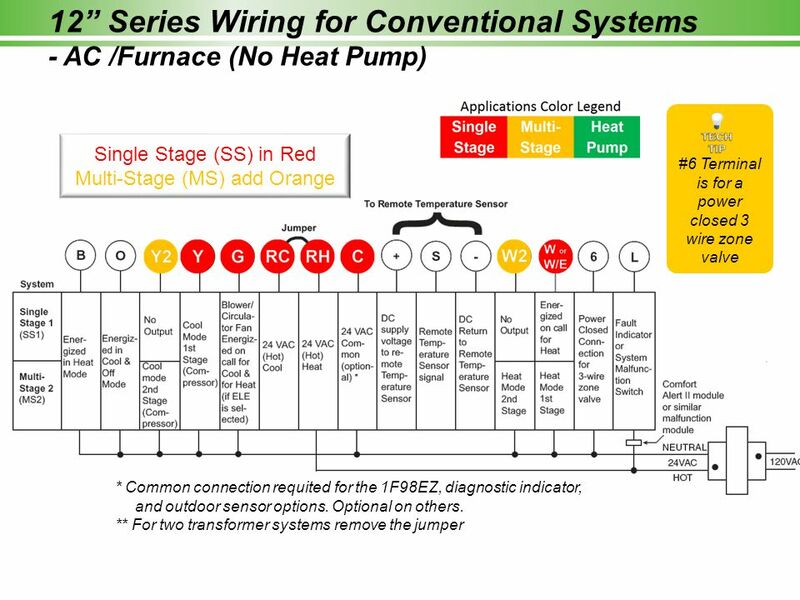 Any additional stages of auxiliary heat should begin to operate and the display will show "System On +2". Press UP or DOWN to adjust the thermostat below room temperature. The heating system should stop operating. 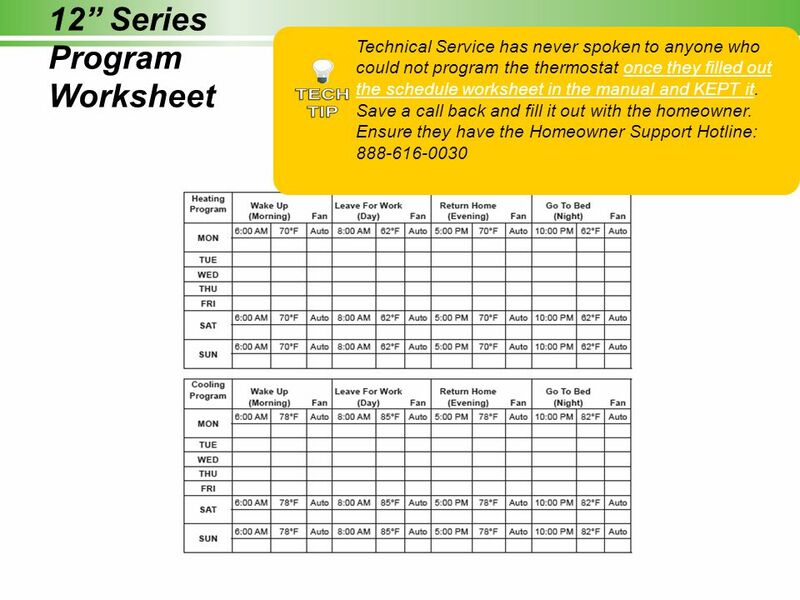 Download ppt "Homeowner Support Hotline:"
402 COMFORT CONTROL LOGIC. Questions SUB BASE Up to 16 wires may be required. Copyright, 2006: Invisible Service Technicians, LLC Invisible Service Technicians, LLC Invisible Service Technician Monitor Activation Process: IST MaintSelectionV3.php. 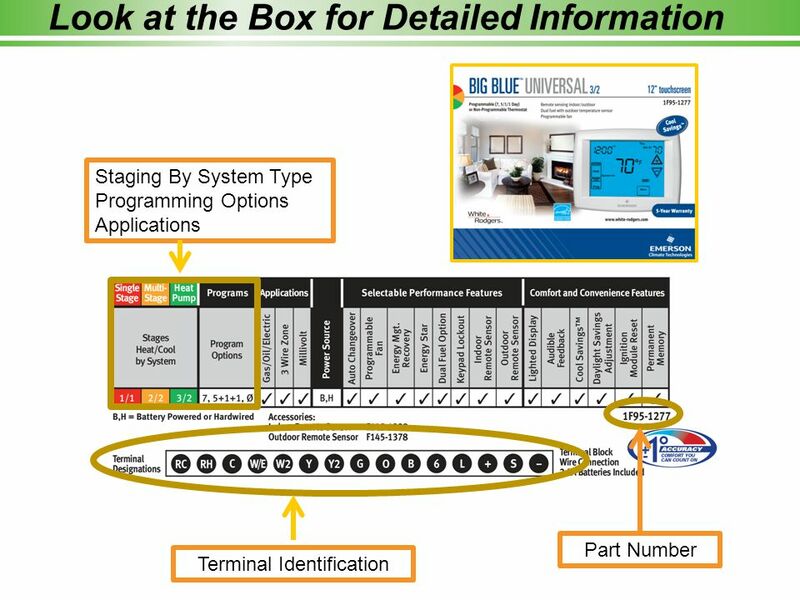 GE job title/1 GE internal information - Not for external distribution 1 GE Security EMEA NPI template – v1 1X Series (phase 1) Conventional Fire Panel. 1 Adaptive Thermostat With Bluetooth Technology Trey Lawrence Jennifer Ogunlowo Scott Snyder Mark Youngblood ECE4007L02, Group 7 Georgia Institute of Technology. Mt. Laurel, NJ MULTI-STAGE NEW MULTI-STAGE TOUCHSCREENS Features & Programming. 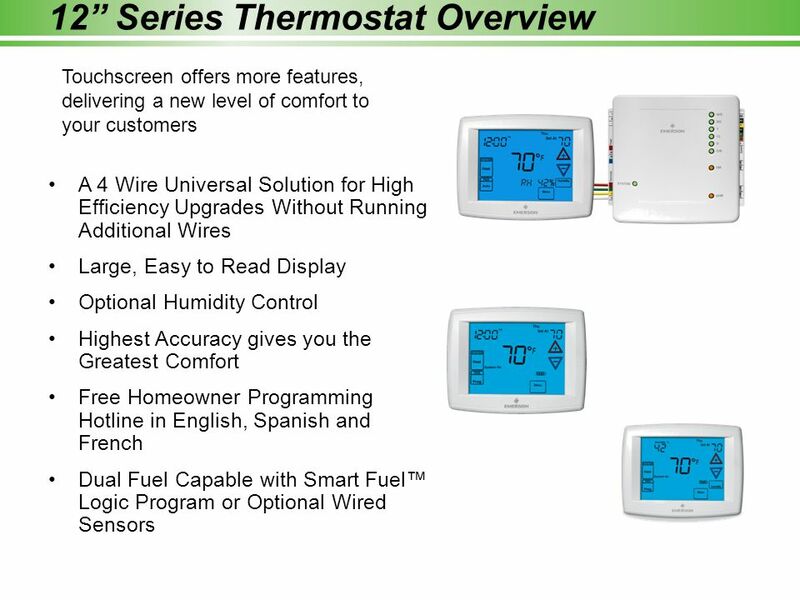 WebStat™ Programming and Configuration of Thermostats. CommercialPRO™ CommercialPRO 7000 Introduction Competitively priced that in most cases beats the competition Key features - Sleek design - Intuitive. FocusPRO ® Training Module Click For Next Slide To advance this module, click when this icon appears on the slide. 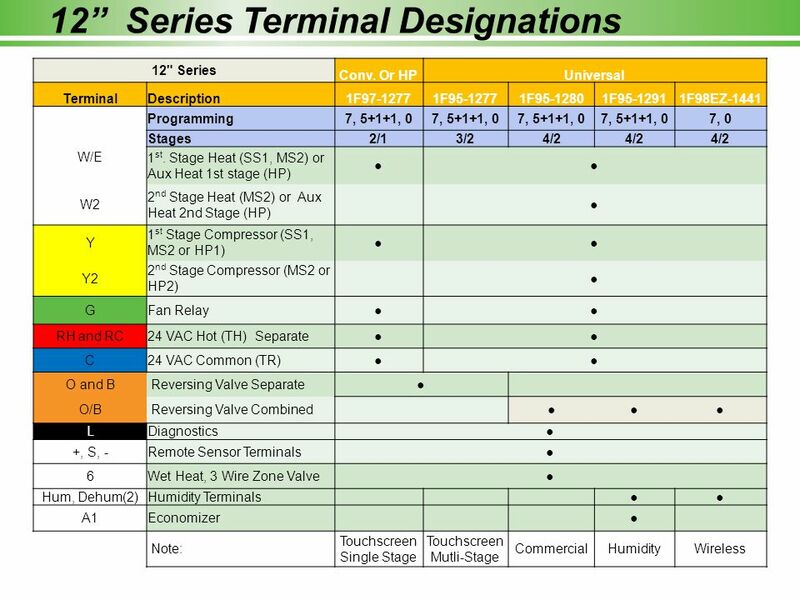 | We make life more comfortable 1 ERV-24 Technician Settings & Operating Manual Protected by one or more of the following.